At the time of this writing the leaking/spilling of an oil well operated by BP in the northern Gulf of Mexico has yet to be fully contained. Crews are right now in the process of lowering a 100 ton concrete and steel container onto a part of the damaged seafloor infrastructure that is leaking. Because the blowout of a well in 1,500 m (5,000 ft) of water is unprecedented, the methods to containing it have never been tried. I surely hope this works and wish the crews working 24/7 on this problem the best. There are so many articles, reports, blog posts, and commentary about this event I won’t try to summarize them all here. Instead, I’d like to highlight one particular column that really spoke to me — ‘A Spill of Our Own’ by Lisa Margonelli in the May 1st, 2010 New York Times. In 2007 Margonelli published a book called ‘Oil on the Brain’ discussing how much oil America consumes and the journey this resource takes from its formation to the pump. I haven’t read the book myself but it has now leap-frogged up to the top of my to-read stack. Effectively, we’ve been importing oil and exporting spills to villages and waterways all over the world. Kazakhstan, for one, had no comprehensive environmental laws until 2007, and Nigeria has suffered spills equivalent to that of the Exxon Valdez every year since 1969. (As of last year, Nigeria had 2,000 active spills.) Since the Santa Barbara spill of 1969, and the more than 40 Earth Days that have followed, Americans have increased by two-thirds the amount of petroleum we consume in our cars, while nearly quadrupling the quantity we import. In 2008, the United States consumed nearly 20 million barrels of oil per day and produced approximately 7 million barrels oil (equivalent) per day (see this EIA report for the detailed breakdown). In the chart below that gap between consumption (red line) and production (gold line) illustrates this deficit. As a result, our net imports (blue line) have increased over time. So, here’s a wild thought to provoke discussion — what if it was required that the amount of oil we consume had to be matched by domestic production? What if we decided to recognize our NIMBYness and be responsible? In other words, what if, as a society, we decided to stop exporting our petroleum-related environmental problems to other countries? Isn’t this what the ‘drill, baby, drill’ crowd is arguing? No. Their main arguments are job creation and energy independence; they are not arguing that we need to take responsibility for the inevitable environmental consequences. In fact, one of their main selling points is that the impact on the environment nowadays is negligible. Additionally, they fail to take into account the negative impact on existing jobs and economies accidents like this have when they claim how this will help the economy. Environmentalists might react to what I’m saying with ‘How could you possibly suggest we increase domestic production in light of this catastrophe! ?’ What I’m saying is that maybe if Americans are forced to actually live with the consequences of their consumption — that is, to have oil derricks in their backyard — might we then stop postponing and finding excuses to transition to new energy sources? American’s support for domestic offshore drilling is very likely falling significantly as they watch the sludge lap up onto the Louisiana coast and as they see with their own eyes how this disaster affects the economy and livelihoods of people on the Gulf Coast. I don’t want to minimize the ecologic catastrophe and local economic impacts that are unfolding, but as we focus on these aspects are we sweeping the consumption issue under the rug? 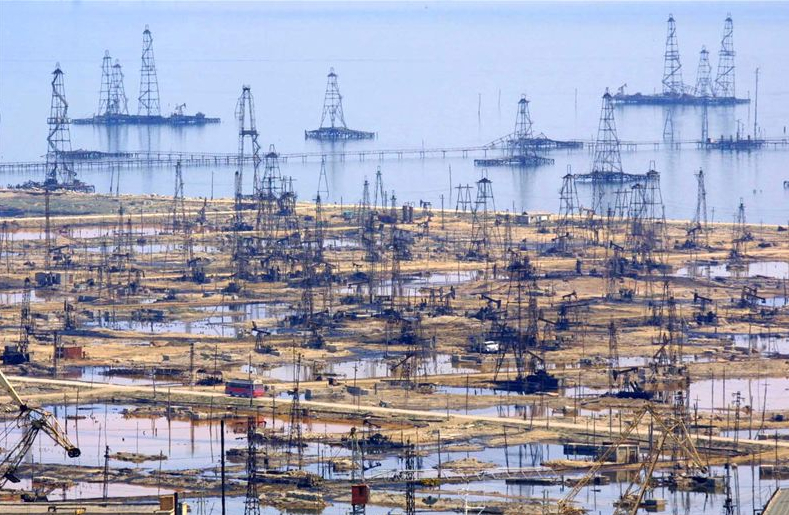 This image of an oil field in the Caspian Sea is what ‘drill, baby, drill’ looks like. This is an example of ‘drill here, drill now’. For those advocating the kind of aggressive increase in domestic production it would take to attempt to close the production-imports gap (if that’s even possible) then please volunteer to have this in your backyard. If you do then I applaud you — at least you’re being consistent. Worse, are those that agree this is not something they’d want in their backyard but, at the same time, they refuse to reduce consumption and/or complain about those who propose laws or regulations designed to reduce consumption. You can’t have your cake and eat it too. However, we need to accept that oil is, and will continue to be, an important resource. Even the most aggressive proposals to ramp up non-oil fuels to the scale it needs to be recognize that oil will be part of the mix for decades. So, in addition to images of devastated wildlife and fisheries shouldn’t the media also be showing graphs like the one above? Instead of the predictable, made-for-cable-TV debates pitting someone chanting ‘drill, baby, drill’ against an environmentalist wouldn’t it be nice to discuss the bigger picture of oil consumption, dependence, and associated risks? I hope the Deepwater Horizon spill doesn’t get bad enough to join Santa Barbara and Exxon Valdez in the rogues’ gallery of huge environmental disasters. But it should galvanize us to address the real problem with oil spills — the oil. note: as I was drafting this post I came across this commentary from the blog 4.5 Billion Years of Wonder, which is worth checking out. Lisa Margonelli appeared on OnPoint Radio the other day and the thrust of her argument is what you have presented. Thanks, Brian, for your comments and the pointers to Margonelli’s writing and the 4.5 Billion Years blog post (which was also excellent). It comes as a relief to read commentary that doesn’t see the world as simple and black and white and recognises that stuff (the origin of life, society, economics, science, oil drilling, UK elections, the carbon cycle, volcanoes, baseball, fudge, the derivatives markets, sand…..) is complex and nuanced. Unfortunately, ignorance and stupidity seem to be intrinsic components of human nature (along with a glorious spectrum of other characteristics, many admirable, quite a few not). Oh dear, I seem to be on another rant …..
Great post; I sent it to a few of my semi-conservative friends. As a 20+ year veteran of river conservation fights in the Midwest I can say most people just won’t act until it clearly affects them personally, and this is especially true when we have political noise machines (e.g. Fox News and the Republican Party) keeping the debate constantly off topic and confused (remember flag burning?). Eight dollar a gallon gasoline will do it, though. And changing base behavior and attitudes can take so long, decades. We have to keep fighting, it’s a moral imperative. Thanks for being part of that. Do you think a backlash against domestic production will make taming consumption easier or harder? At least DrillBabyDrilling doesn’t sweep the problem under the rug for the next decade. The Caspian Sea may look ugly, but at least those people don’t believe that oil is magically delivered from magical pixie land. Lab Lemming … I’m not sure what’s gonna happen. At this time I think it could go either way still. The 60 Minutes story the other night about what happened on the rig the night of the blowout and such was definitely something everyone should see … but, now would also be a good time to do a comprehensive expose on just how much oil we consume. Great post Brian. We were just having the same discussion last night among a group of oil co. geologists. Thanks for the great write up and I will have to check the book out as well.